GOVERNMENT has described as “regrettable” a decision by NewsDay to push an MDC Alliance agenda to attack the person of President Mnangagwa after the paper on Wednesday used a routine travel warning by the United States (US) to cast doubt on the sustainability of the peaceful environment in the country. On Wednesday, the privately-owned newspaper led with a story headlined; “Polls: US issues travel alert”. It followed up yesterday with a leader screaming; “US travel warnings an indictment on Mnangagwa”, suggestig the situation was volatile in the country. In a statement to The Herald yesterday, Secretary for Information, Media and Broadcasting Services Mr George Charamba said: “Today’s NewsDay leader, ‘US Travel Warnings an Indictment on Mnangagwa’ is as illogical as it is unfair. By NewsDay’s own admission, the last such travel warning by the US Government was issued in November 2017 before Cde Mnangagwa’s Presidency. Mr Charamba said the peace prevailing in the country was not accidental. “Needless to say, the peace which prevails in our country is not accidental or fortuitous, but has been deliberately cultivated in our people who shun violence, and firmly confirms Zimbabwe as a stable country where law and order are observed and enforced respectively, yet strictly within the confines of democratic governance. 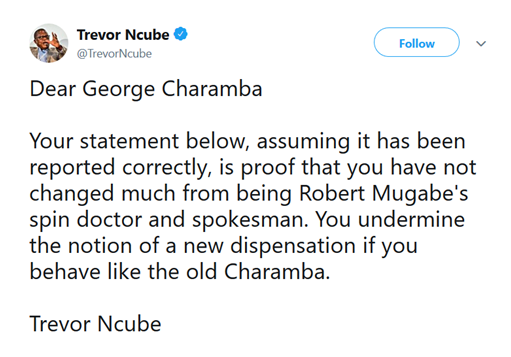 Mr Charamba said the NewsDay report was regrettable. “What is regrettable is that NewsDay, which surely knows better, uses this routine communication by a foreign Government to both cast doubt on the durable peace obtaining in the country and to attack President Mnangagwa personally by pooh-poohing his government’s highly successful engagement and re-engagement efforts,” he said. Mr Charamba noted that foreign direct investment continued to surge courtesy of efforts by the new administration under President Mnangagwa. “Zimbabwe’s ratings as a safe destination for foreign direct investments continue to soar on the back of this highly successful engagement and re-engagement effort launched barely seven months ago,” he said. “By any count, this is a remarkable turnaround. “As NewsDay will readily testify, key among the many Western companies which have shown interest in investing in Zimbabwe are Americans conglomerates led by General Electric, a good many of which are set to invest in many sectors of the economy, most notably in infrastructure, energy and health. Mr Charamba said the growing interest in the country was evident for all to see. Mr Charamba said abuse of the US travel advisory by the NewsDay to further opposition interests was surprising. “Even more surprising is NewsDay’s abuse of the US travel advisory to push the agenda of an opposition party whose panicky demands on the constitutionally independent electoral body, the Zimbabwe Electoral Commission (ZEC), is both unlawful and absurd, to say the least,” he said. “In terms of the Constitution, ZEC is required to take independent decisions for as long as they are consistent with the law, and of course to operate without undue influence from any quarter. In a poignant, hard-to-miss irony, the idea of independent commissions, of which ZEC is a part, came from the same opposition which now seeks to undermine and/or overrun them. “Not only that, under our Parliamentary system, the opposition directly participated in processes of staffing these independent commissions whose operations they now daily challenge and besiege. In the case of ZEC, the opposition figure who cries the loudest today – surprisingly with undisguised sympathies from NewsDay – actually played a leading role as a co-chair of a subcommittee of Parliament’s Committee on Standing Rules and Orders which made recommendations on would-be ZEC commissioners he now attacks. Mr Charamba said as Head of State and Government, President Mnangagwa reaffirmed his commitment and determination to ensure that all registered Zimbabweans do vote on July 30 and that “they do so in an environment of peace and tranquillity, to secure an electoral outcome which is free, fair and credible by national and international standards”. He said ZEC should be allowed to carry out its mandate without interference from anyone.